So let’s focus instead on the word itself: aperitivo comes from the Latin aperire which means “to open,” which makes sense, since one of the purposes of aperitivo hour is to “open” your appetite for dinner later on. We also love the idea that the aperitivo is meant to be enjoyed with friends or family, and so it “opens” people to each other’s company and helps to spark conversations and relaxation. 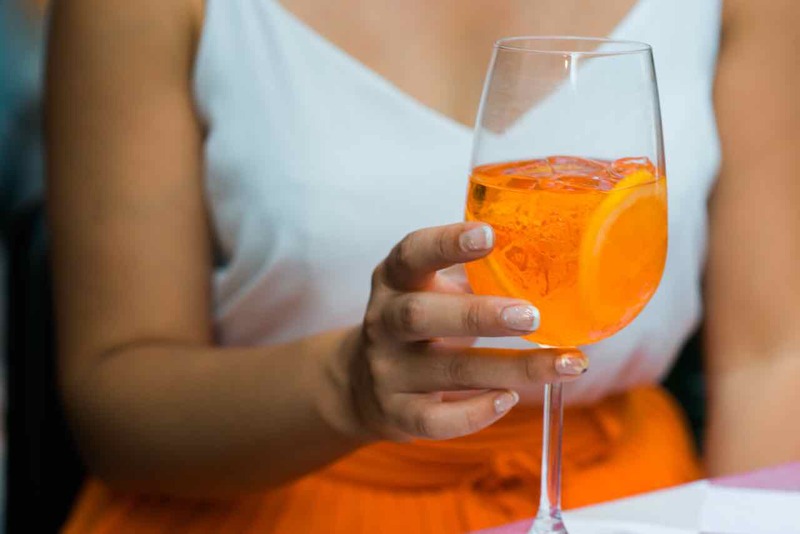 As for the drink itself, there is no one specific drink that is classified as the go-to aperitivo beverage, but there are a few popular options: an Aperol spritz, a Negroni, or wine, to name a few. It’s customary to choose a more bitter drink rather than a sweeter one, as this helps to stimulate the appetite. Popular snacks to enjoy alongside the drink include cheeses, olives, or nuts — again, something savory to stimulate the appetite. Also, it’s important not to fill up on the snacks — these are meant to be the introduction to dinner, not the meal itself! 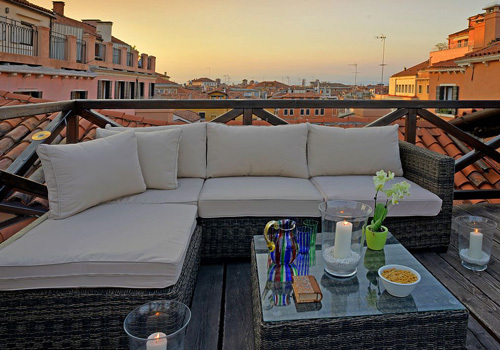 Now that we’ve given you some background on the aperitivo in Italy, it’s time to talk about those amazing terraces. Spending all day under that Tuscan sun can get pretty hot, so it pays to have your own private terrace for enjoying the countryside during the much cooler evenings. 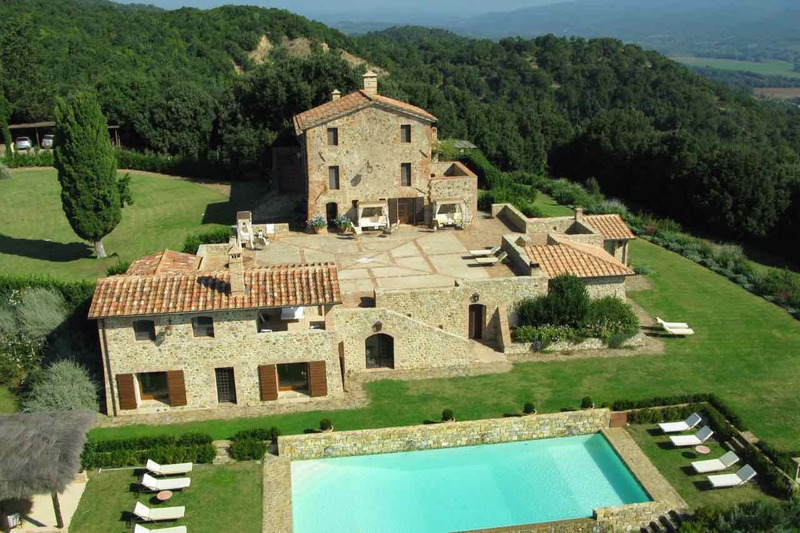 Brunello Vista can sleep up to 14 guests and is set atop the hills of vineyards and olive orchards on 25 acres outside of Siena. It’s so idyllic that it’s hard to imagine a place so peaceful and beautiful even exists in real life. The villa comes equipped with a massive terrace, with high-end patio furniture and a gezebo. Or if you’d rather, sip your aperitivo by the incredible infinity swimming pool. Since you’ll be staying in the heart of the super Tuscan wine country, we recommend sampling some of the local product during your aperitivo hour! Who says you can’t have a spacious, verdant terrace in the middle of a bustling city? This gorgeous, 400 sq foot terrace has not one but TWO sitting areas: one with a table for enjoying a meal, and another smaller area for more intimate conversation and maybe some early morning reading with coffee. Adorned in every corner with plants, this terrace is a garden paradise in the middle of the city. We recommend a little vino rosso (red wine) or prosecco (sparkling white) for your Roman aperitivo! 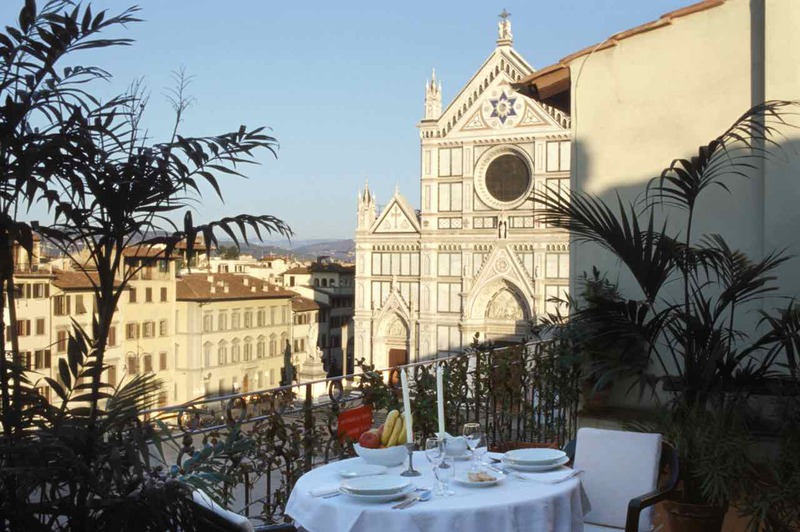 This is the terrace to end all terraces: just look at that stunning view of Santa Croce! Plus, this apartment is situated in a historic palazzo (yes, that translates to palace) that’s decorated with frescoes from 1620! An important part of aperativo culture in Italy is taking a moment to really savor the little pleasures in life, and a drink on this terrace is truly a once-in-a-lifetime moment to savor. There is always something to observe in the piazza even if just the daily life of Florence or the play of light on the beautiful facade of the famous cathedral. For anyone interested in sports, there are also soccer matches that take place in the piazza in front of Santa Croce during the month of June, so there’s the added bonus of some free entertainment during your evening apero. Plus you’ll easily have the best seat in the arena! The name of this stunning apartment is an apt one: this is a terrace with views that you’ll remember forever. There is a table and chairs for two on the terrace, so it’s perfect for a romantic getaway. 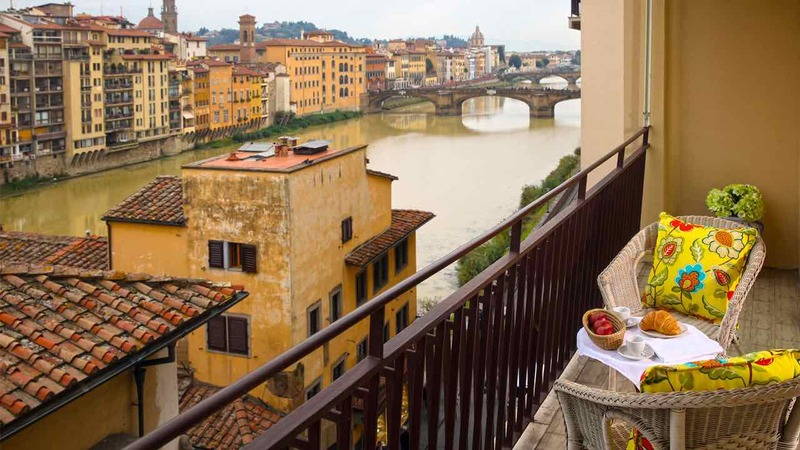 From the terrace you’ll be able to enjoy views of one of the most famous (and photographed) rivers in Europe, the Arno, as well as its most famous bridge: the Ponte Vecchio where travelers have crossed the river for thousands of years. This little terrace is perfect for anyone who enjoys timeless views with their appetizers and cocktails! 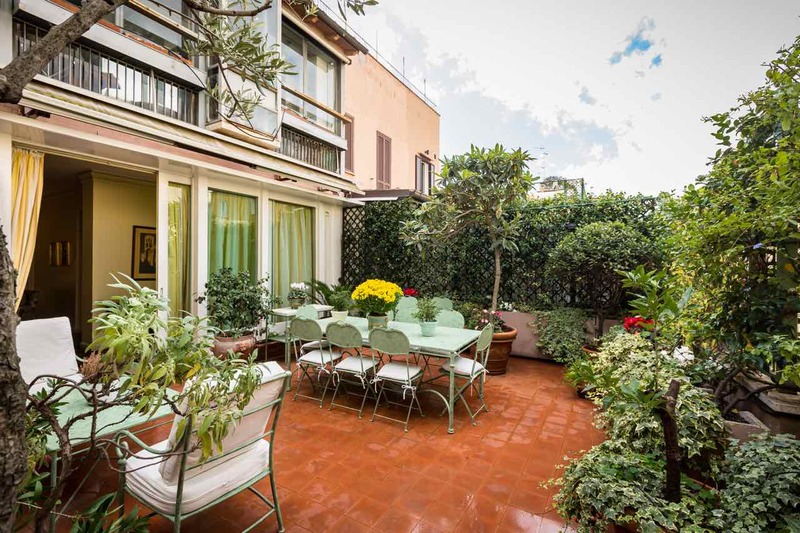 This apartment was basically made for aperitivo hour — it has not one, but two terraces! The first is a large terrace that is shared with two other apartments in the building. With seating at a table for 8 and another smaller, cozier seating area, a great place to mingle with other vacationers, or for a larger traveling group to meet up (if you’re all renting the three apartments that share the terrace). Cassia also has a private rooftop terrace with a sofa and seating around a table. We would recommend that your apero of choice be the Bellini, one of Venice’s signature drinks! As a bonus, the famous Harry’s Bar (where the Bellini originated), is just a short walk away from this apartment if you want to enjoy another terrace nearby. So there you have it! Have we convinced you yet to plan your aperitivo tour of Italy? If so, you can contact Italy Perfect at [email protected] or 1-888-308-6123 and we’ll help you find the terrace of your aperitivo dreams.